Ninja Theory co-founder, Tameem Antoniades reckons that fans doubting the upcoming Devil May Cry prequel are not being entirely honest with themselves. Earlier in the year Devil May Cry Fans were unpleasantly surprised by Ninja Theory's upcoming take on the series. The most prominent complaint, or at least the only one that could be heard over the angry hooting and calls for immediate bloody revolution, was about Dante's new character design. Fans, it seems, were not pleased with Ninja Theory's decision to replace their beloved platinum-haired studmuffin with a guy who wouldn't look out of place on the cover of Trainspotting. Ninja Theory's response, in essence, is a raised hand, palm forwards, and instructions to voice your concerns to it, because the face certainly ain't listening. "We've got our plan and we're not changing it," Tameem Antoniades said at a presentation at Gamescom 2011. Talking about character designs, producer Alex Jones claimed that Capcom Japan is just as responsible for Dante's controversial new look as Ninja Theory. Character design is what Capcom Japan is deeply, deeply involved with," said Jones. "[Ninja Theory and Capcom have had] dozens of meetings over character design," he added. Antoniades claimed that the game "will feel like a proper Devil May Cry game when you have a controller in your hand" and that, "The people who are skeptical secretly want to like it. And our job is to prove it's Devil May Cry in essence." Judging by its past efforts -Enslaved and Heavenly Sword- Ninja Theory is spilling over with writing talent, something previous Devil May Cry developers Capcom sorely lack, but there's some question as to whether Devil May Cry's gameplay will match the quality of its Capcom-made predecessors. Previous Devil May Cry games all ran at a solid 60 frames per second, while the upcoming prequel runs at half that. It's not uncommon for console titles to be locked to 30FPS these days, but it's a first for the Devil May Cry series. 60FPS games are noticeably smoother than their 30FPS counterparts, an important feature in a game which relies on strict timing and quick reactions. Antoniades defended the decision, claiming that the lower frame rate allows more interesting game mechanics, such as the way levels can change drastically in real time. He also claimed that the "feel of 60FPS" would be maintained. 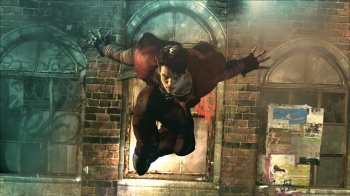 Devil May Cry will be released for Xbox 360 and PlayStation 3. No word on a release date yet.